Are YOU The Next BALLE Fellow? Even if you missed the webinar, there are still many ways to learn more about this excellent organization and this opportunity. 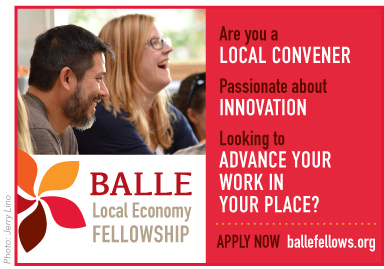 Where other programs focus on individual social entrepreneurs trying to scale single enterprises, the BALLE Fellowship focuses on local economy connectors – people who each represent, convene, and influence communities of hundreds of community entrepreneurs. This is an incredible opportunity for top innovators to connect with their peers, strengthen their capacity for transformative personal and community change, and help reshape local economies across North America. To get the most of out this webinar, please review information on the Fellowship, watch this brief video, and download your application prior to the session. As we are preparing for our annual 2013 BALLE conference in June, I am reminded of one of the main reasons people are drawn to BALLE: to learn how to create a strong and vibrant local economy in their own communities. Knowing that not all of you will make it to Buffalo in June, and as I reviewed our incredible list of speakers and conference agenda, I was inspired to share this list of key ingredients in hopes that it will inspire you, even in some small way, towards action in your community. Because there are SO many juicy things to share with you – and because we know your free reading time is precious – we’re breaking this down into two parts. And for those that will be joining us for #2013BALLE Conference in Buffalo, we’ve highlighted some of the incredible pioneers who will be speaking on these subjects at our upcoming conference. We need to know the people that grow and make our food and to have systems in place to get fresh, affordable food into underserved areas. When we support a localized food system, we keep our dollars in the local economy and lessen our dependency on external food sources that can be damaging to both people and our environment. We’re not okay unless we’re all okay. Job access, skills training, business ownership and cooperative models serve so many purposes. They build community wealth and keep money circulating locally; they empower people through personal ownership; and they harness the collective energy of the entire community and channel it towards a greater good. We need to bring back local manufacturing and to be able to meet some of our needs locally. If we start using regional resources – local people, local businesses, local products – to meet our regional needs, we support all the people that contribute to our vibrant, local economy. Central to a vibrant local economy is having strong relationships with each other, and new technologies are creating more opportunities to get connected. We can connect makers and growers with buyers and with each other. People can now share spare bedrooms, services and yard tools at the click of a button. Technology will never replace personal relationships, but it’s a wonderful way to get introduced. At the center of everything, we need to create communities that want the best for each other. Developing personal relationships and establishing trust is one of the most important elements of a vibrant, local economy, and leading with generosity can be powerful way to start. BALLE is one of my go-to organizations, partly because their deep reservoirs of knowledge come from localized economy leaders, rather than some academic institution or a centralized big-city NGO. Therefore, their knowledge and growth seems to be thoughtful and they advance real ideas. Their webinars are done well and the next two focus on local procurement in government contracts. Local First Webinar Series | BALLE – Business Alliance for Local Living Economies. Claire’s Restaurant, Hardwick Vermont is a LLC (actually 2 LLCs) that has 3 groups involved: investors in the real estate group, owner/managers (3 people) and 50 subscribers/lenders. The one owner raised money by knocking on doors and reaching out to her network, since she was the only long-time Vermonter among the (3) owners. She found investors who invested in the real estate group which owns the lease (and subleases to the restaurant) and the equipment. Their investment is very long-term and they were told that at the beginning. If the restaurant fails, they can get someone to take over the new lease. The subscribers/lenders gave 1000.00 each to the restaurant itself and get their money back in increments of 25.00 in 10 months of the year over 4 years at the restaurant. The subscribers can transfer ownership of their subscription and family can use the subscription. There is no cash out provision. Since the restaurant does not own the equipment, it does not have major debt. Is a C-corporation and has a board of directors of 7 and 3 full-time staff. Issued stock at 100 each to NY residents, goal was to raise 500,000, which took 5 years to do. Shares can be transferred to out of state holders after 9 months. Since there is no majority stockholder, there is little chance for formal financing. They ended the offer with 750 investors, mostly by asking their early shareholders to host “share” parties where board members could sell stock. Did constant events to keep their name and idea in front of people throughout the 5 years. Got the last 42,000 because of an in-depth New York Times story on cover of Sunday edition. Energy Efficiency Project: 500.00 min, 2-5 %, 5 years, 90k raised. So, why haven’t farmers markets taken this model to find their start up? And why not project loans among the shoppers and farmers for short-term projects to create merchandise or an earned income stream for the market or for a farmer? Calling All Food-Based Businesses: New book seeks your capital-raising stories! New book on financing food-based businesses seeks your capital raising stories. We all seek to make our capital work effectively for our home communities, and moving our money is an important step. But after we move our money, what happens to it? And how can we influence what that money does in our communities? And how communities can replicate some of their successful programs and community partnerships. Come learn how to make your money work for your community by partnering with local banks and credit unions. The New Economy is being shaped at the grassroots level. Connect, share and learn from 700 pioneering business owners and investors, elected officials, philanthropists, economic development professionals and BALLE (Business Alliance for Local Living Economies) network leaders as we spotlight the most innovative and entrepreneurial approaches to growing healthy, resilient local economies.